NOTE: This webpage is not currently being updated. It was last updated in 2012. If you know of a project that has achieved LEED Platinum certification from USGBC/GBCI, but that is not yet listed here, please notify us. 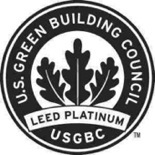 Beyond the U.S., there are now LEED Platinum-rated projects in 24 other countries (so far): Australia, Brazil, Canada, China, Finland, France, Germany, Great Britain, Hong Kong, India, Italy, Japan, Mexico, the Netherlands, Saudi Arabia, South Korea, Spain, Sri Lanka, Sweden, Switzerland, Taiwan, Thailand, Turkey, and the United Arab Emirates.